Now in latest development the comet has grown. Now the diameter of it’s outer coma exceeded 200,000 km/1,24,274 Miles of course, at this time we have only low resolution images, but they still allow us to estimate its current size. We want to remind you that the outer coma, it’s very discharged gas envelope, not the nucleus itself, estimates of the nucleus size has not changed. 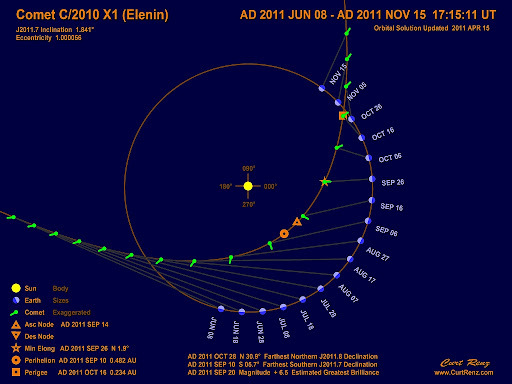 We want to remind you that Elenin comet (C2010 X1 ) is a long period objects in elliptical Orbit: long period Objects are a big danger for the inner Planets. There seems to be a pattern forming every time Elenin lines up with Earth and another planet or the sun we have an earthquake, the nearer Elenin gets the bigger the earthquakes. Elenin’s minimum angle to the Sun will be 1.9º. According to Mensur Omerbashich he used the comet C/2010 X1 (Elenin) for his research, as it has been adding to robustness in terms of very strong seismicity since 2007 (in terms of strongest seismicity: since 1965).